Gareth is a Partner and head of the Family team. He is highly experienced in divorce settlements and cohabitation disputes. His practice is national and international (with a particular interest in French divorce issues) and often involves entrepreneurs, senior executives, business people and their businesses, and those in the media. He acts for clients with very little money to those with substantial wealth. He aims to resolve disputes as swiftly, discreetly and constructively as possible, whilst protecting his client’s best interests. He also advises on protecting assets and businesses from divorce, including trust and company structures, and mitigation of “the divorce tax”. 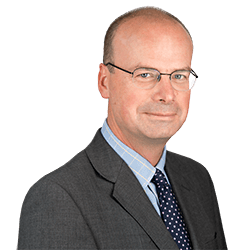 Described as ‘Superb’, ‘extremely intelligent and charming, with a total grasp of the law and the details of the case’, his ‘vast experience makes him a master strategist’ (Legal 500, 2017), Gareth has been top ranked in Chambers Guide and Legal 500 for many years. Gareth joined Clarke Willmott in 2005 from Burges Salmon. He trained and worked at divorce specialists Manches in London from 1992 to 1997, and returned to his native city Bristol in 1997. Gareth is a former chair of Bristol Resolution, an accredited mediator, a regular speaker, in particular, on inherited wealth and divorce, as well as a well known author on insolvency and divorce. Advised in Hill v Haines – key case in Court of Appeal on divorce and bankruptcy issues. Advised on case involving substantial assets with enforcement issues in France and Asia. Acted for business where shareholding under threat in divorce proceedings for shareholder. Advised on pre nuptial agreement and trust structures for client with substantial inherited wealth about to marry. Advised on case where husband failed to disclose assets/income, to successful conclusion.